Joe Amster and Estee Wagner of Rae Kushner Yeshiva High School discuss peer counseling at the Jewish Family Service of MetroWest’s In Their Shoes training session. 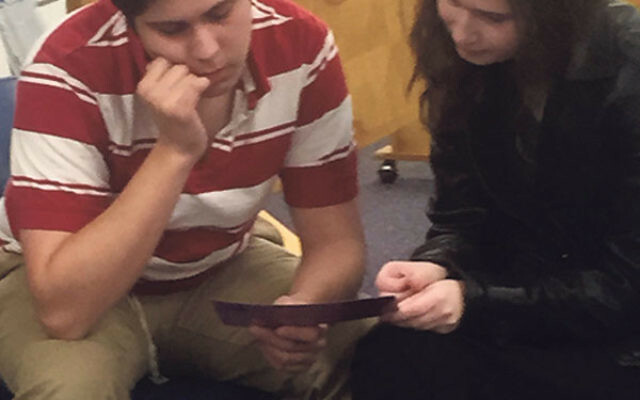 Armed with a grant of $2,355 from The Partnership for Jewish Learning and Life’s Iris Teen Tzedakah Program, the Jewish Family Service of MetroWest is seeking to expand a program to train teenagers as peer counselors for victims of domestic abuse. Since April the program, called In Their Shoes, has trained four sets of high school students in how to recognize and lend a sympathetic ear to other youngsters who may have been exposed to situations of abuse or violence in school or at home. Two student groups from Millburn High School held sessions at private homes in Millburn and Short Hills, one from Rae Kushner Yeshiva High School at its campus in Livingston, and one on the Aidekman campus in Whippany for teens involved in the J-Serve program run by the Partnership, the Jewish identity-building organization of the Jewish Federation of Greater MetroWest NJ. Their instructors are social workers affiliated with the Rachel Coalition; founded in 1997 as a JFS division, the coalition provides services and support for domestic abuse victims; it has nine partner agencies in the Jewish community. “We want to get the word out to as many teens as possible, in and outside the Jewish community,” said Shari Bloomberg, a social worker who is clinical director of the Rachel Coalition. “The mission is to start prevention when kids are at an earlier age, as young as middle school,” she said. There is a growing need for such educational programs, Bloomberg told NJ Jewish News. “The rate of dating violence and sexual abuse on college campuses is staggering. We are looking to start a program in the fall dealing with intimate partner violence on campuses. It’s huge. But if we can get to these kids when they are still in high school, they will have the knowledge and ability to help. We want to reach out to teens who might be potential victims, but we also want to reach out to others” who may witness situations. 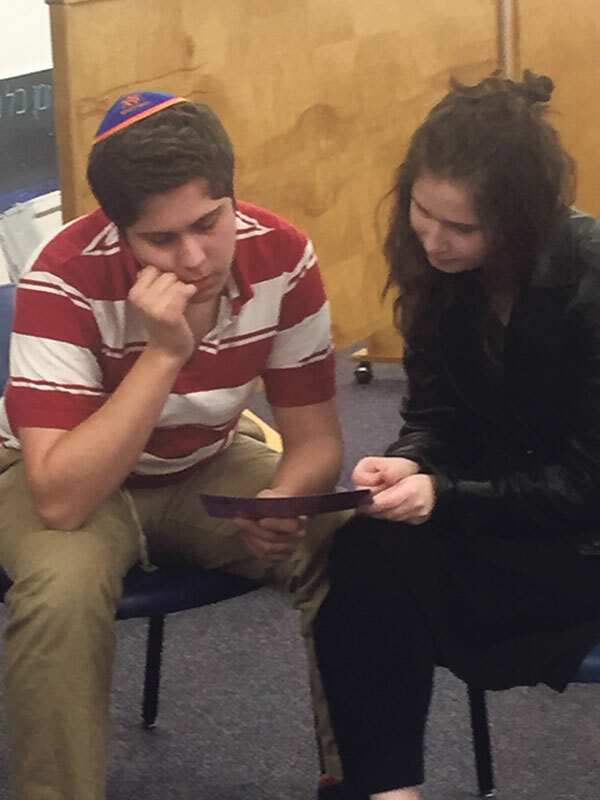 Estee Wagner and Joe Amster, both from West Orange and juniors at Rae Kushner Yeshiva High School, took part in a training session at their school on April 13. Estee told NJJN she has always wanted “to get involved more in fighting domestic violence. In addition to those taking part in the sessions, two other students are in the process of being trained to be peer facilitators who will lead discussions with fellow teens. One is Bloomberg’s daughter Alyssa, a junior at Kushner who lives in Elizabeth and has already undergone four training sessions. She believes she and others her age can make a difference in young people’s lives. “I realize how much of an issue domestic violence has been for adults, but there is a lot of ignorance among teenagers who are not aware of how important and dangerous it can be,” Alyssa said.